The coaches who’ve made a significant impact in the life of Scottish rugby star Stuart Hogg have been awarded the Coaching Chain award at the 2017 UK Coaching Awards. The showpiece annual event is seen as one of the most prestigious within the coaching community and was held in London last week. 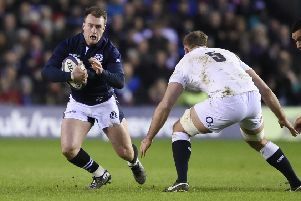 Hogg (25) is widely regarded as one of the leading full-backs in rugby union, having earned over 50 caps for Scotland and toured with the British/Irish Lions on two occasions. The Coaching Chain recognises contributions made by individual coaches throughout an elite athlete’s life in helping them to achieve their potential. The team acknowledged as part of the award comprises John Hogg, Mark Wright, John Johnstone, Bryan Easson, Iain Monaghan, Sean Lineen and Gregor Townsend. John Hogg is Stuart’s dad and the first person to put a rugby ball in his hands. Mark Wright was Stuart’s coach at Trinity Primary School, instrumental in fostering energy and enjoyment in the game at an age when it is hugely important. John ’Rocky’ Johnstone was Stuart’s strength & conditioning and skills coach throughout school up until U16 at Hawick High School. He was also Hawick Academy manager and was in constant contact with Scottish Rugby to ensure Stuart was up at the top of his development. Bryan Easson was present throughout Stuart’s career from Borders U16 to Scotland U20 as a BT Sport Academy coach, as well as being his first age-grade Scotland coach at U17 and an important influence on his skills development. Iain Monaghan (BT Sport Academy coach, Glasgow Warriors) was Academy manager when Stuart signed for Glasgow Warriors and helped ensure he had the best possible experience as he began his professional career. Sean Lineen was Stuart’s first senior professional coach at Glasgow Warriors and introduced Stuart to his position as full-back, while Gregor Townsend was backs coach at Scotland when Stuart won his first cap and, later, head coach at Glasgow Warriors and now of the national side. Townsend has also been enormously influential on Stuart’s development as a player. Mark Gannon, chief executive officer of UK Coaching, said: “The 20th anniversary of the awards has seen some of the best examples of coaching throughout the nation celebrated. We thank all the finalists for their incredible services to coaching. “We saw a record number of finalists nominated and our independent judging panel deliberated long and hard to acknowledge the people and organisations that dedicated their time to the development of others through coaching. This year’s event saw an expert judging panel choose their winners from an impressive list of finalists, following a record number of nominations. The principle of the awards is to recognise the contribution coaches make in transforming lives across the UK.